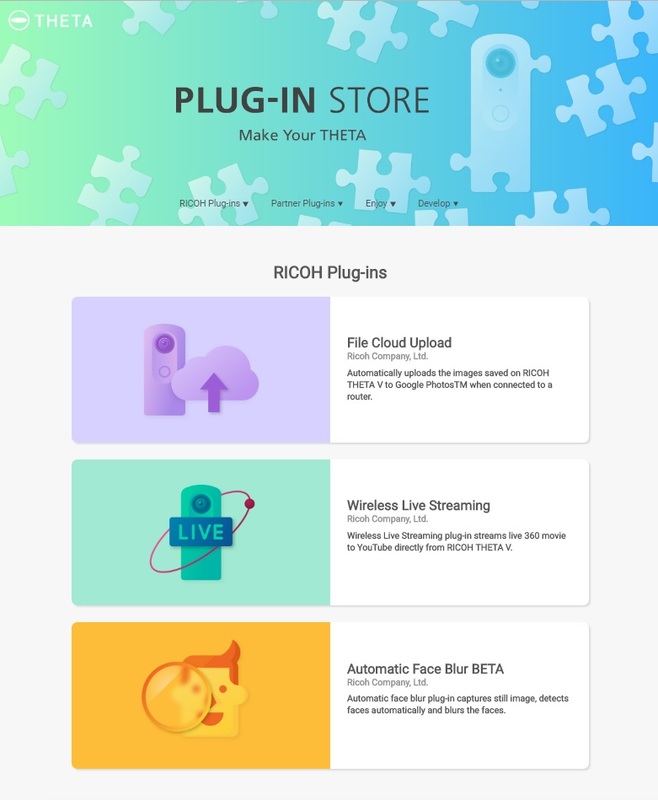 You can now add new functions to your Ricoh Theta V by installing FREE plug-ins from the Plug-in Store, which is now live. The plug-ins include features such as wireless live streaming and automatic face blurring. Ricoh Theta V (reviewed here) is the first 360 camera to enable users to add new features by installing plug-ins made possible by its Android OS. The first plug-in added remote playback ability to play 360 photos and videos from compatible TVs. Now you can get additional plug-ins, available for free download from the Ricoh Plug-In Store. Future plug-ins will include Angle of View Control and Time-Lapse Video Shooting. I’m also hoping that they’ll make a plugin for shooting and stitching in RAW format. Are there plug-ins you’d like to see? Let me know in the comments! Hi, i’m from Brazil, i buy a Theta V, i would like a plug-in to be made to fix the internal memory of the camera, in the case of finishing the battery during video recording, the file is impossible to be erased and occupying much of the available memory for photos and videos, I have a file of 5 Gb ghost and hidden without possibility to erase by the normal processes, i try in Windows, Mac OS, Android and IOS, but no sucess. I think that everybody will love a plug-in like this that fix the memory back to the original size ! Thank you for you time. Hi Eduardo. Have you tried connecting the camera to a PC and then cutting and pasting the Theta’s photo and video files to your hard drive? I moved my files without any problems. you don’t read what a wrote ? i have now a HIDDEN FILE it is impossible to erase to free the memory, because i cant see it, i try to see it in Windows, Mac, IOS Android and others operation system to see the hidden files inside the Ricoh Theta V (i enable to see hidden folders in the operations Systems, but always mount like a camera (file system DFC) not like a hard drive formatted in Fat, Fat 32, NTFS, exFAT, HFS+, etc.